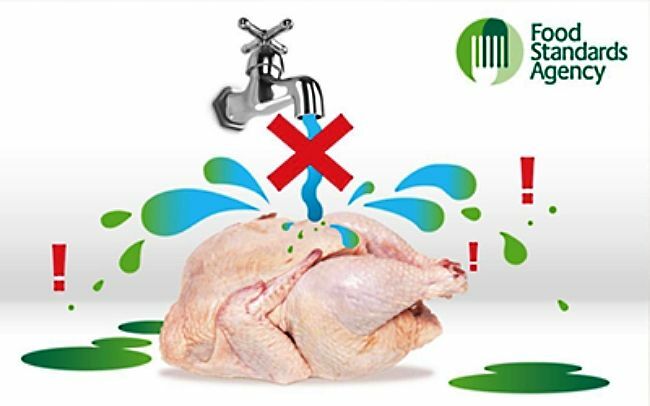 It is outrageous that health authorities throughout the world have advised that raw chicken and other poultry should not be washed or rinsed before use, because of the risks of spreading contamination. Recent studies have shown that up to 70% of fresh chicken sold in supermarkets throughout Britain is contaminated with Campylobacter bacteria that can cause lethal infections. The study also showed that the contamination rate increase by 10% in the last three months before the study was done. Poultry may also contain harmful bacteria such as Salmonella and Listeriawhich can also cause lethal infections. Why is such a contaminated and dangerous product still being allowed on supermarket shelves? Chicken and other poultry are also 'factory' produced meats with many additional concerns related to the using of antibiotics and other additives add to the feed. Chickens are also selectively bred to produce enlarged breast muscles. Such birds can struggle to stay upright in crowded pens. While the claim that growth hormones are used in chicken production is probably a myth, the birds grow incredibly quickly to huge sizes, suggesting that artificial growth supplements (not hormones) are used. 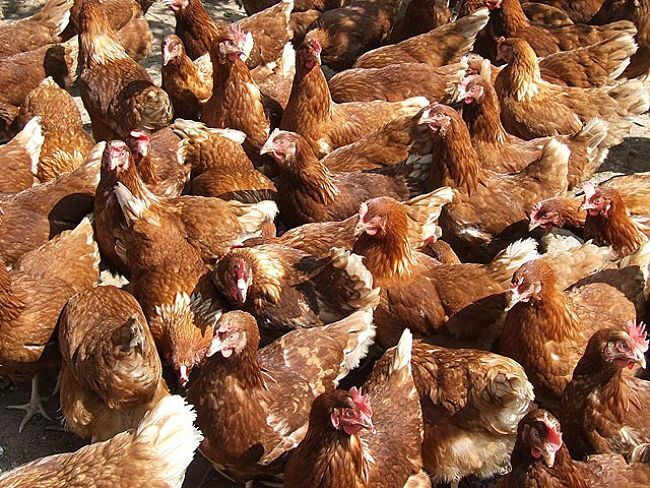 Antibiotics are also widely used in the poultry industry boosting the risks that the pathogens they contain may be resistant to many of the common antibiotics used to treat human infections. This increases the risk of harm from contamination. Finally, there are concerns about the care and housing of the chickens in crowded pens and 'factories'. 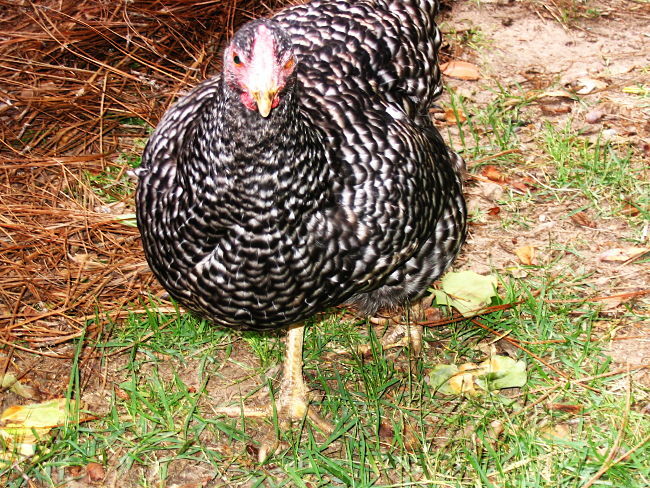 Even so called 'free-range' reared chickens, are often allowed less than one square foot for each bird in the 'free-range' yards. Remember that the term 'organic' only applies to what the chickens are fed and the bans placed on the use of chemicals such as antibiotics. But, just like organic eggs, the term organic says nothing about the care and 'humane' treatment provided for poultry produced in yards, barns and free range factories. Campylobacter is a bacteria that can cause severe intestinal infections after people eat contaminated food that is not handled properly or cooked properly. Typical symptoms, include severe abdominal pain, fever, diarrhoea, vomiting, headache, nausea and secondary dehydration. The symptoms can last for from 1-10 days and can be mild to severe. The young and elderly, and those with impaired immune systems can die due to the infections and complications. It is estimated that about 100 people die every year, with an average of 280,000 people per year being infected with this bacteria. The infection is very debilitating even when it is not lethal. It is estimated that about 80% of the Campylobacter food poisoning occurs through eating uncooked chicken, or via kitchen contamination from processing the raw chicken in the kitchen. Pets with diarrhoea carry the bacteria, and it can be spread in water and via kitchen waste. How can the risks of contamination and food poisoning be avoided? Cooking chicken properly using a meat thermometer is recommended. The safe minimum internal temperature for poultry is 165 degrees F (75 degrees C). Careful attention to proper food handling to prevent contamination can stop the bacteria being spread from uncooked chicken in the kitchen. 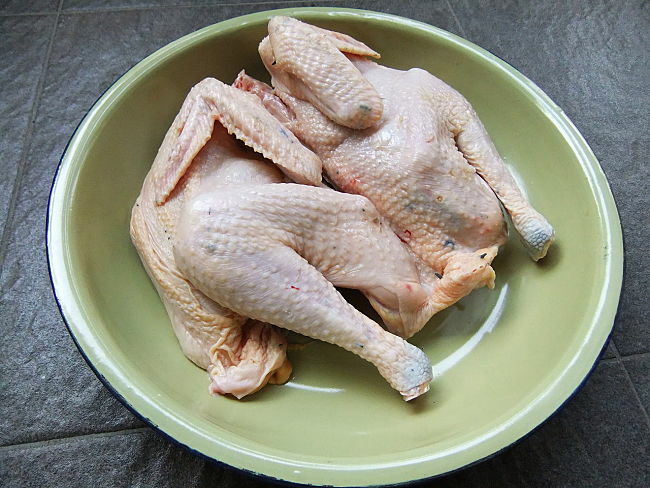 Various health authorities now recommend that the raw chicken not be washed as this risks spreading any bacterial contamination around the kitchen. Poultry may contain harmful bacteria such as Salmonella, Listeria than can contaminate other foods in the kitchen. 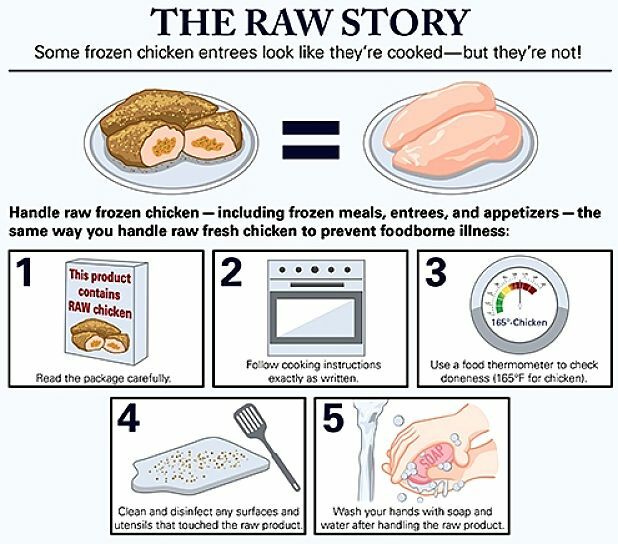 Freezing chicken can also kill Campylobacter bacteria and other potential pathogens. 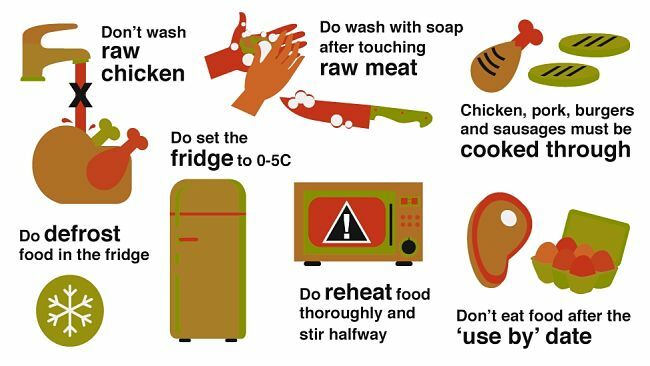 Washing your hands frequently (3-4 times) when preparing and cooking chicken is also recommended. Also, vigilance is recommended to prevent cross-contamination with pathogens transferred from raw foods like poultry, to cooked foods, and even salads, via knives, cooking utensils, chopping boards and benches used for food preparation. Chickens are now bred to have huge breast muscles, and they may end up too heavy for their legs. They can be top-heavy and often tumble over in the cramped conditions in the yards and barns. They are also bred and fed to grow incredibly quickly. By comparison, it has been calculated that if humans could me manipulated to grow at the same rate as modern poultry a baby human would weigh 660 pounds by the age of 8 weeks. A year-long study by the Food Standards Agency (FSA) in the UK found that about 73% (thre-quarters) of fresh raw chicken bought from UK retail outlets and independent stores, tested positive for campylobacter, a dangerous food poisoning bacteria. The survey tested about 4,000 samples from a range of stores. The study also found that all of the major retailers had failed to achieve industry targets to reduce the incidence of campylobacter in raw chicken meat. It is time to avoid commercially produced chicken and other poultry products and to turn to grass raised beef and wild caught fish and other seafood. I have banned fresh chicken as an ingredient in our household.